Some homes have a hanging rack in the kitchen where pots are exposed. 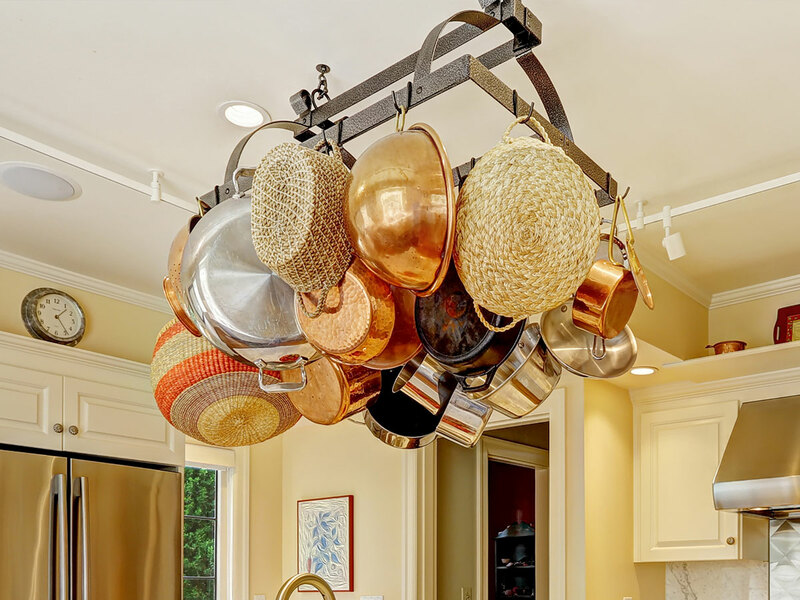 Often times people choose to have copper pots that hang, as they also serve as a decorative and artistic look to a kitchen. The trade off with this is that the copper pots and hanging rack need to be polished on a regular basis to keep looking good. Make sure you set yourself the appropriate schedule. The two main products to use when cleaning copper is salt and lemon or lime juice. The combination of acid from the citrus and abrasive nature to salt creates the best mixture for cleaning and polishing your copper pots. You can either create a paste by combining the two together and using and old hand towels to scrub the pots. Some people also cut the lemon or lime in half and dip it into some salt, using the citrus as the sponge itself. Either method works or it just may depend on the shapes and crevices in your copper cookware. Here is a video from Essortment on this.